Christmas Vacation just FLEW by! We had a ton of fun playing, eating and enjoying family. My parents and brother came into town Thursday night. 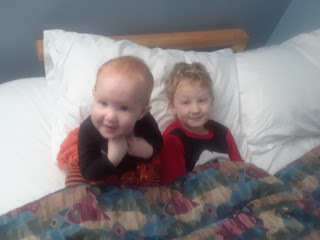 Brooklyn and Dustin had a blast making the bed for their overnight stay. Logan put EVERY blanket we own on the bed to make sure they had the most comfie bed. I think he changed the blanket 6 times. Every time he had me take a picture and text it to the Grands to see if they liked that one best. I like to make something for the kids every year. Home made gifts are my favorite to give because the whole time I'm making them I can think of the person I'm making them for. Brooklyn got a quilt for her baby but it's getting harder to think of things to sew for the boys. 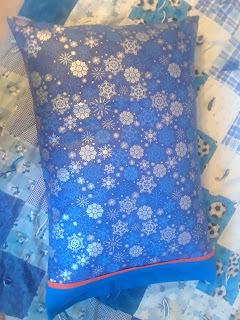 So I sewed some winter pillowcases for them. Friday we saw Despicable Me 3 at the Dollar Theater with my parents, Mike's family and Sheila's family. The cousins LOVED getting to watch a movie together. After that we headed to Sheila's church for a family dinner and talent show. Everyone brought one sweet and one savory thing. It was tons of food! I think I went home with more food than I brought. The kids had fun preforming, and it was a good night all around. Saturday we slept in and went swimming with the Grands and my side of the family. My parents had a free hotel night and they thought it would be fun to use it here so we could all enjoy the pool. When we were done swimming we played games in the lobby and ate pizza. It was casual and fun. We headed home for nap time since Brooklyn was exhausted! That night we headed over to Dave's parent's church for the Plastow family Christmas party. We ate, the cousins played, decorated cookies and we exchanged stocking stuffers. Brooklyn thought she was a big kid and just loved chasing the big kids around the gym. We let them play until a half hour after bed time; she completely wore herself out! I don't think the other cousins have as early a bed time as we do, so we're always the first to have to leave Plastow parties. Sunday was Christmas Eve. We only had one hour of Church so we got to spend most of the day together. That night Bill and Linda came over for dinner and presents! We usually have them over Christmas eve for cookie decorating, but since we decorated cookies the night before at the family party we changed it up a little (we don't really NEED that many cookies). The kids got new jammies for Christmas and were so excited! They have been counting down the days until they got new jammies since I measured them in October. They got new ones from both sets of Grandmas and have refused to wear anything else. Brooklyn then convinced Grandma and Papa to read books to everyone. She LOVES to read. If I ever can't find her I know she's either digging through her books or her brother's. After the Grands headed home we read the story of Christ's birth in Luke 2 and finished the night off with a few chapters from the Boxcar Children. 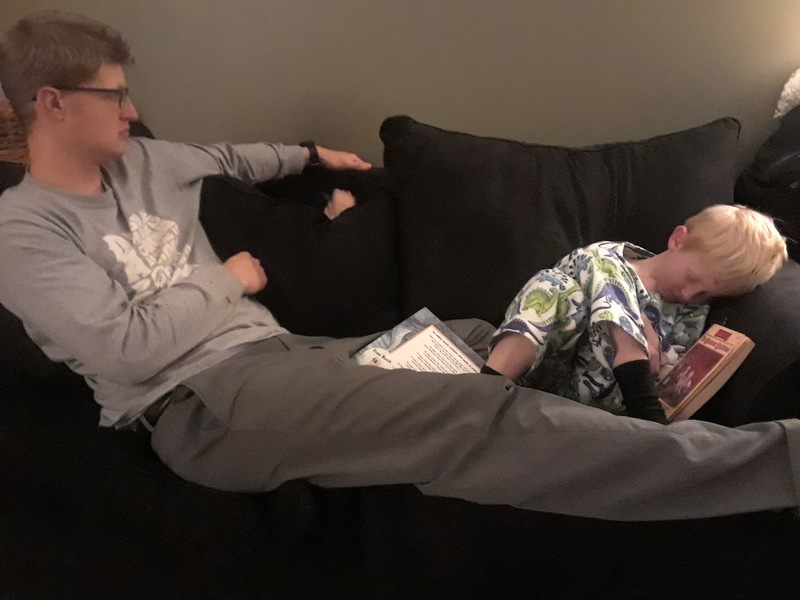 The kids were so exhausted from all our fun that they fell asleep on the couch before their 8:00 bedtime. Christmas day was a fun family day! We all slept in until 8 and opened gifts! 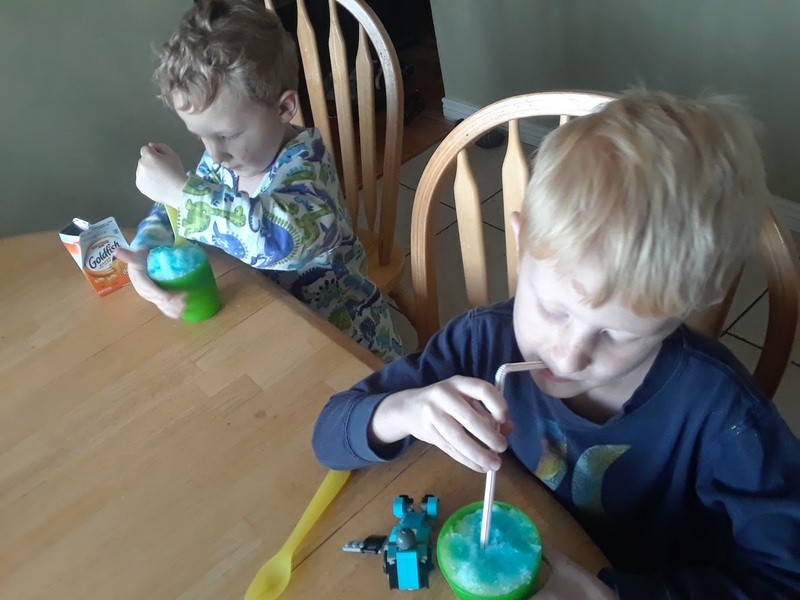 Logan and Dustin loved trying out and playing with everything. Brooklyn was just happy to be included in the fun. All day the boys floated from gift to gift, enjoying everything new they got. They mad a ferris wheel out of Dustin's new Tinker Toys. Logan read his new book Dog Man to Dustin (which he finished reading in less than a day). They just had fun with each other. 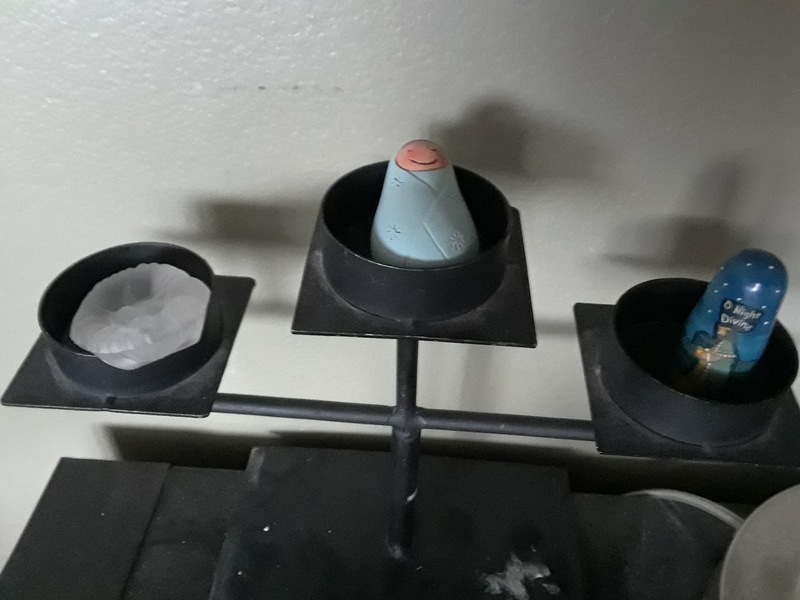 Of course they had to sneak in a Science Experiment or two. We enjoyed seeing the reaction Baking Soda and Citric Acid had when mixed with water. After lunch we headed to the Golf Course to enjoy the fresh snow! Brooklyn LOVED it!!! Every time she sledded down she would squeal with laughter. When we stopped she would clap happily. Then she would whine until someone took her up the hill again. I think she did the most sledding of all the kids. It was tons of fun to see her enjoy herself so much. 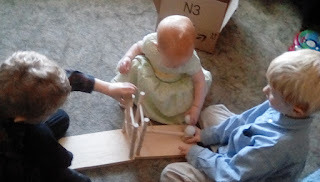 The boys had fun sledding, but they especially enjoyed building things. Snowmen, snow forts, and a stockpiles of snowballs for a major fight! Dustin lost his favorite hat over all our activities, so he's been wearing one of mine. I need to make him a new special hat, one that fits... but haven't gotten around to it yet. He has no interest in any of our other kids hats. Dave was in heaven! He loves all things snow, and sledding is one of his favorite parts about winter. After sledding we warmed up with hot chocolate then cooled off with snow cones (made out of snow from the back yard). The boys thought that was the best! 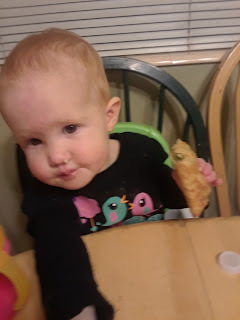 For dinner we made egg rolls from my Grandpa Yoder's recipe. Brooklyn enjoyed her first eggroll. She devoured it and demanded a second. And a third. Brooklyn has been getting into everything lately! 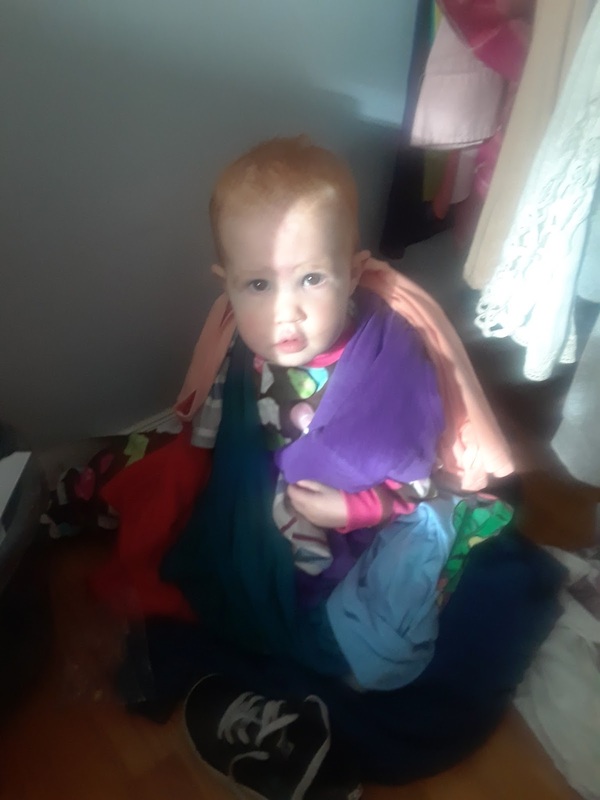 If I leave my closet open she pulls all my shirts off their hangers and puts them on herself. She's such a little stinker. And finally this is the video I made of Logan singing in his school's Christmas Program. He's really grown up a lot over the past year. He used to hate these things, but this year he really hammed it up! This is such a busy time of year! I realized last week I didn't make Christmas cards this year. Oops! Maybe I'll send out two next year. We didn't take a family photo this year either. What can you do? We decorated for Christmas! I don't think we've decorated for anything since last Christmas so this is a big deal. I made Brooklyn a penguin stocking so Santa can leave us all something this year! This is why I have given up on decorating... I can never find my decorations. They disappear and reappear in a place that would have looked better. Silly me. 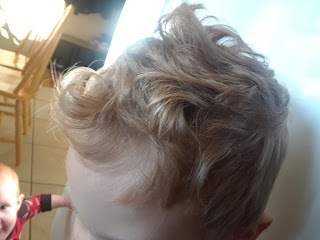 Dustin's hair has become curly over the past few months. He loves it even though he doesn't let me style it for him. 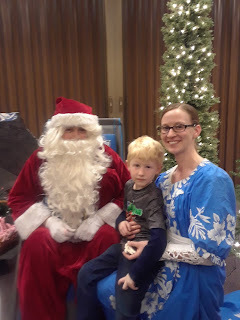 We saw santa at the Ward Hawaiian Christmas Party. Dustin and Brooklyn were terrified. Logan tolerated him long enough to get a pic and tell Santa he would write a letter telling him what was desired for Christmas. We went to Dave's work Christmas party somewhere in there too. They always have good food, and this year wasn't a disappointment. It's nice to visit with Dave's co-workers and friends a few times a year. Speaking of work friends... Dave's co-worker Edgar invited him to a Foo Fighter concert last week. He was out until about 1 (he said the concert was still going when he left). 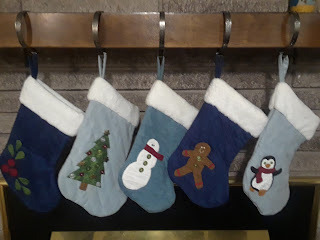 So after I put the kids down I put together stocking stuffers for our family Christmas Parties and the ladies I visit from church. I had fun, Dave had fun. It was a win. We've also been to more movies in the past month than in the last year! A few weeks ago Dave's work had an event where they were doing a free dinner and a movie (Justice League). Dave's parents were nice enough to sit, so we got to go on a free date! 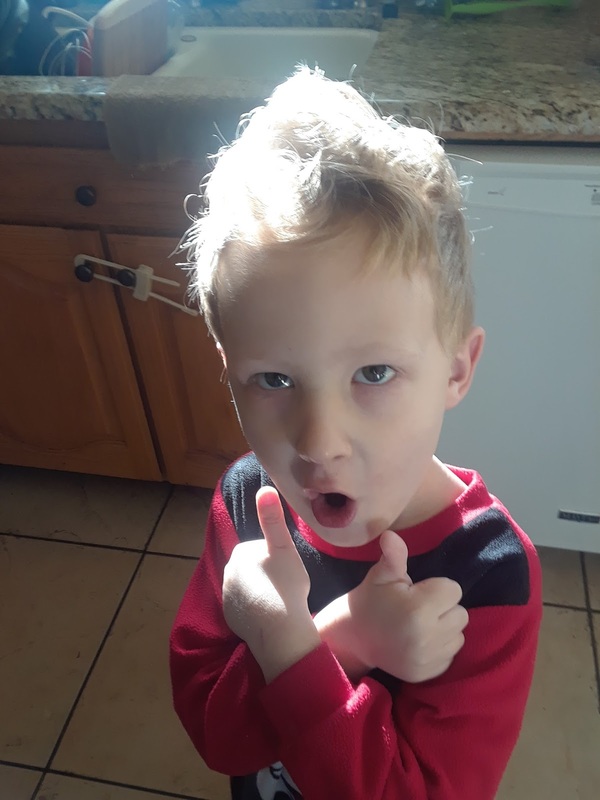 A few Saturdays ago Dave's Dad's work had a free movie event where the boys got to see Coco with Grandma Linda and Dave, Bill and I went to see the latest Thor movie. Brooklyn was great until the last 15 minutes and I had to take her out. Last weekend my brother Mike's work also had an event (I'm seeing a theme here) where he got 4 tickets to Star Wars: The Last Jedi. So we hired a girl from church to watch the kids so we could see that! Pshew! Movie central with the Plastows. Now that Brooklyn is running all over the house she thinks she rules the world! She wants to do whatever her brothers are doing! Dressing up, playing duplos, whatever she's there. 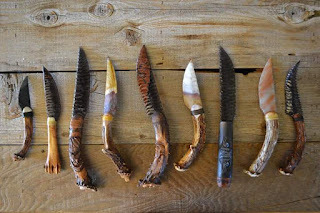 I've also been selling knives on Ebay for my Dad. 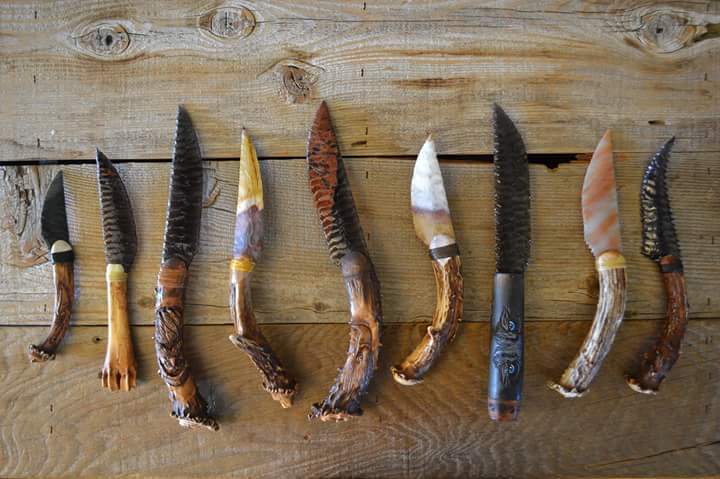 He loves to make them but doesn't love to sell them. So I've been listing and shipping for him. His friend Doug reached out to me to give me tips on how to sell on eBay and remind me what a great Dad I have. Last year the church I attend launched a program they call Light the World. It's a service oriented program where they give you a scripture each day to remind you of the real reason behind Christmas. This year I haven't followed it as well as I did last year, but I did decide to make a meal for a family in need each week. I had three picked out prior to starting this, but now looking at the calendar I have 5 meals scheduled for December. It has been great as the boys and I are preparing the meals to think of the family in need and of Christ's birth. I had scheduled to bring a meal to one family the week before and when I texted to verify a time for a drop off the wife was totally unaware the husband had accepted. 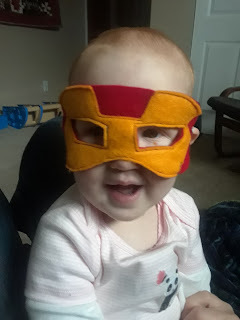 She said it worked out perfect because husband had surgery that day (I was completely unaware of this) and since she was also recovering and has 5 kids under 6 years old, it was the perfect day for some help. It's awesome to see God nudging us in the right direction if we are willing to be his hands and bless others. 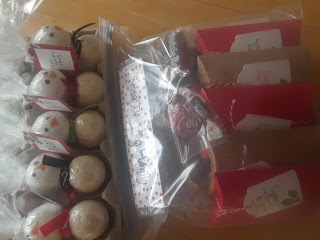 This week we are buckeling down on delivering the last of the treats for our neighbors and getting ready for CHRISTMAS! I think I have all the gifts wrapped (if I would just stop buying them). I bought all the food last Friday so I wouldn't have to enter the store this week if possible. We'll see if I forgot anything. I think we're pretty much ready. We still need to visit Temple Square and see the lights, but other than that we're right on track.